Knesset Members from the Land of Israel lobby toured the Etzion Bloc and the young communities that are expected to be "regulated" two weeks after Prime Minister Netanyahu decided to remove these villages from discussions of the Supreme Planning Council. 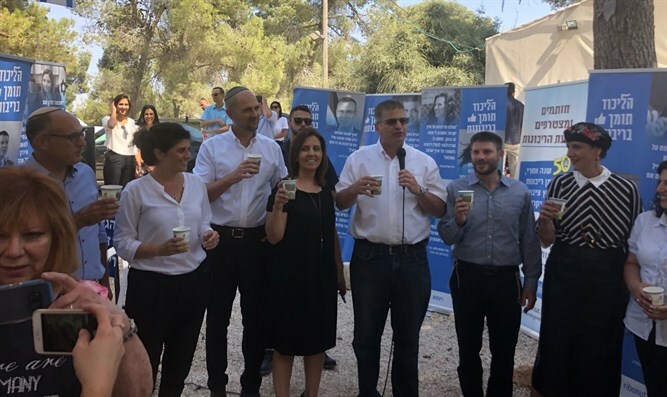 The tour was attended by Lobby Chair MK Yoav Kisch (Likud) and MK Betzalel Smotrich (Jewish Home), Social Equality Minister Gila Gamliel (Likud), Gush Etzion Regional Council Chairman Shlomo Ne'eman and MKs Shuli Mualem (Jewish Home), Sharren Haskel, Nurit Koren, and Amir Ohana (Likud). During the tour, participants were exposed to resident's difficulties and inability to receive basic infrastructure services, all due to delays in planning and delays in establishing the regulation committee decided upon in the cabinet. During the visit, the head of the Lobby and the MKs announced that due to the delay, they would submit a bill to regulate the young communities with the opening of the upcoming winter session. The tour began with the young community of Ebay HaNahal that is waiting for a zoning arrangement and was suddenly removed, together with the community HaRoeh HaIvri, from Supreme Planning Council discussions following Netanyahu's instructions. Lobby members noted there are at least 30 communities with a status similar to those of Ebay HaNahal: Places where there is no legal impediment to arranging them, and require only professional planning work and a political decision by the government. From there they continued to the settlement of Sde Boaz next to Neve Daniel and visited the ruins of Nativ Ha'avot. The tour ended at Givat Oz and Gaon, with a toast for the New Year. Lobby Chairman MK Yoav Kish said, "The government must expedite arranging the young settlement process in accordance with the cabinet decision. We're committed to preventing suffering of residents of communities that don't receive basic municipal services. It's inconceivable that there are citizens who are bound by responsibilities who don't receive rights." "We came here to see with the eyes the impossible reality of young settlement in Gush Etzion," said Knesset Member Bezalel Smotrich. "Along with the flourishing settlement that we see here thanks to the dedication of the settlers, there are hundreds or even thousands of residents who pay taxes, serve in the reserves but are denied the basic rights of a citizen that they don't receive. The Land of Israel lobby aims to advance the issue and we'll continue to press the Prime Minister and Defense Minister until we succeed." Gush Etzion Mayor Shlomo Neeman said, "We're pleased to have the impressive Land of Israel lobby in the Knesset working for the benefit of the young neighborhoods in Judea and Samaria, which is a code name for settlements established by the State and at its expense to expand settlement. And today the State is alienating them and in effect turning the residents and councils into criminals, not of their own accord. "We're pleased that the Lobby chose Gush Etzion to raise the issue on the public agenda. Only recently did we experience how the neighborhood of Ebay HaNahal went off the regulation agenda because of some whim or another overseas. Gush Etzion is on the right side of the sea and on the right side of the country and we demand that our government keep its word and finalize settlement." Social Equality Minister Gila Gamliel said "Jewish settlement and applying Israeli sovereignty over areas of settlement in Judea and Samaria are a national and security interest of the State of Israel. We're at the cusp of a defining moment, an historic moment with a political window of opportunity that may not return. It's time to make historic decisions and act decisively to shape a new reality in the Jewish space. This is the way of the Likud and together we'll lead a right-wing national and proud government that will strengthen and develop Jewish settlement in Judea and Samaria." MK Shuli Mualem said "arranging settlement in Judea and Samaria, and within it young settlement, is the order of the day to create a life of rights and responsibilities for residents and neighborhoods for young people in existing communities. The goal is to apply Israeli sovereignty in Judea and Samaria and to normalize the lives of the citizens there." MK Amir Ohana said, "The struggle for Judea and Samaria is a greater one that answers the question of whether after 2,000 years the Jewish people deserve to have a state within its present borders with Judea and Samaria, the cradle of our culture. Our answer is yes - the struggle for the State of Israel, for the Land of Israel, not only for its geographical area, but for its character as well, has not ended. Our steadfastness in Judea and Samaria will be our strength in the State of Israel." MK Nurit Koren also concluded, "Today I arrived on a tour of the Gush Etzion settlements in order to strengthen the young settlement. As a member of the Land of Israel Lobby I'll do everything in my power to regulate and apply sovereignty in Judea and Samaria." MK Sharren Haskel said, "We came here today to support and identify with the settlements in general and Gush Etzion in particular, and to state clearly that the Gush is an inseparable part of the State of Israel, part of Jewish history and culture, and we'll work as one within the coalition to develop it." Yesha Council Acting Director Yigal Dalmoni said, "Thank you for the great support of the participants from all over the country. Your arrival here strengthens us. The Yesha Council promotes settlement arrangements, along with two important tasks: to bring a million Israelis to live here together with infrastructure and employment development, and equally important is applying Israeli sovereignty in Judea, Samaria and the Jordan Valley. Together we'll succeed."